When Chicago architects Raeder, Coffin and Crocker were selected by Duluth’s Chamber of Commerce to build a grand office building, Henry Raeder created this high Victorian design: two almost identical six-story wings separated by an open court but joined by a first-story arched entrance of elaborately carved rock-faced stone. The ornate structure was topped near the back with a 140-foot Gothic tower complete with turrets and a balcony. Façades featured brick, red tile, sandstone, polished granite, terra cotta, and copper. Columns with carved capitals standing three stories tall decorated both wings. Because of its owners—who occupied the top three floors from 1889 to 1903—the Manhattan Building was commonly called the Chamber of Commerce building. 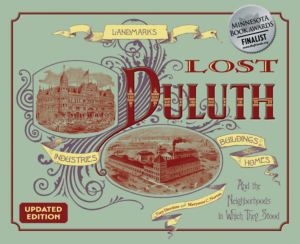 The Chamber merged with the Duluth Commercial Club in 1902 and moved to the Torrey Building. In 1909 the organization would build the Commercial Club at 402 West First Street, which was renovated into the Duluth Athletic Club in the 1940s. After the Chamber left the Manhattan, attorneys, real estate firms, mining companies, and forest product businesses occupied the building’s many offices. By the 1930s its popularity dropped and many of its offices sat vacant. The building was razed in 1941. In 1942 the Northland Building was built on the site of the Manhattan; it remains there today.